For all tests, I’ve used the guest VM created on the ESXi hypervisor as a client. For measuring NFS and iSCSI performance, I’ve used two instruments: DiskSpd v2.0.17 and FIO v3.4. In order to squeeze the maximum performance out of our SSD during benchmarks, I’ve measured the optimal load parameters for FIO and DiskSpd, such as the number of threads and outstanding I/O value. The primary test indicated that with FIO and DiskSpd, the maximum SSD performance can be achieved under 8 threads and outstanding I/O value 4. Therefore, I’ll hold all further tests under these launching parameters for these utilities. Let’s get into a bit more details on our testing tools. DiskSpd is a really handy instrument for testing storage. Reliable and precise workload measurement and flexible parameters – basically, it has all you need for synthetic storage subsystem testing and validation. As to FIO, it’s a well-known tool used for testing the performance of storage systems. It’s a cross-platform utility with an open source code – FIO scores! I’ve performed all further tests inside the ESXi VM (Windows Server 2016). The CPU parameters and memory for VMs when connecting the NFS share and the iSCSI target remained the same. 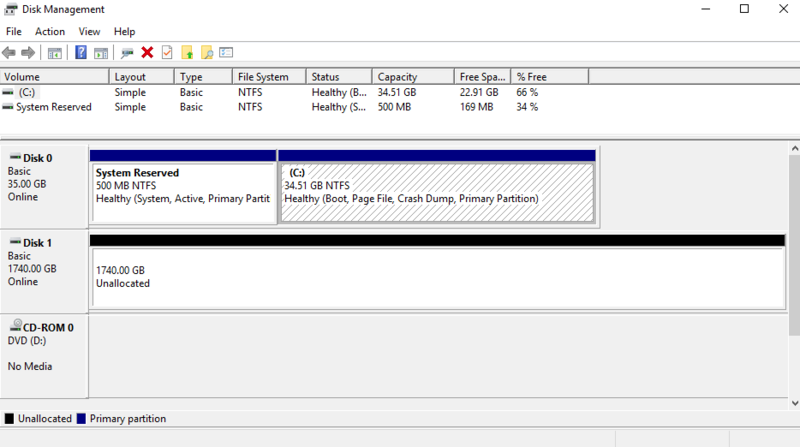 Next, in the VM, I’ve created a new disk in NFS Datastore with disk size equaling the Datastore capacity. 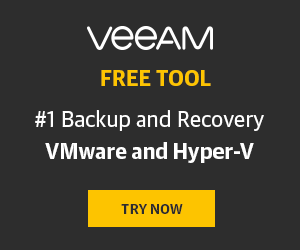 When connecting the NFS disk to the VM, the only possible virtual disk provisioning policy you can choose is Thin Provision. In order to test iSCSI, I’ve installed StarWind VSAN on Host-1 and created a device with 1,7TB storage without a cache memory. 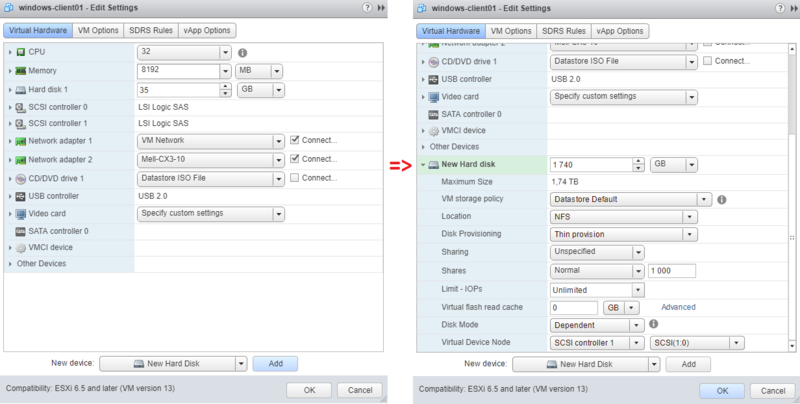 To identify StarWind iSCSI Disk, in VMware, you need to go to Host=> Configure => Storage Devices and perform Storage Rescan. 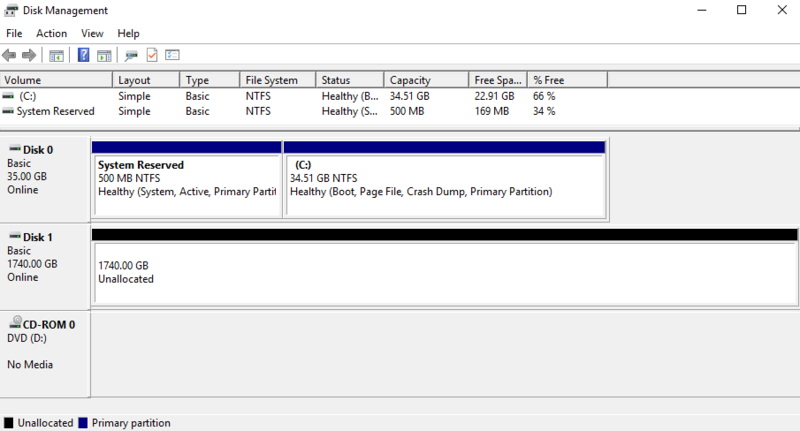 In the VM settings, I’ve added StarWind iSCSI disk as RDM Disk. To compare the virtual machine CPU workload, I’ve tested NFS and iSCSI under 4k random read pattern using DiskSpd. You can see the results in the image below. Now, let’s take a look at VM CPU workload during testing with 4k random read pattern, this time with FIO tool. 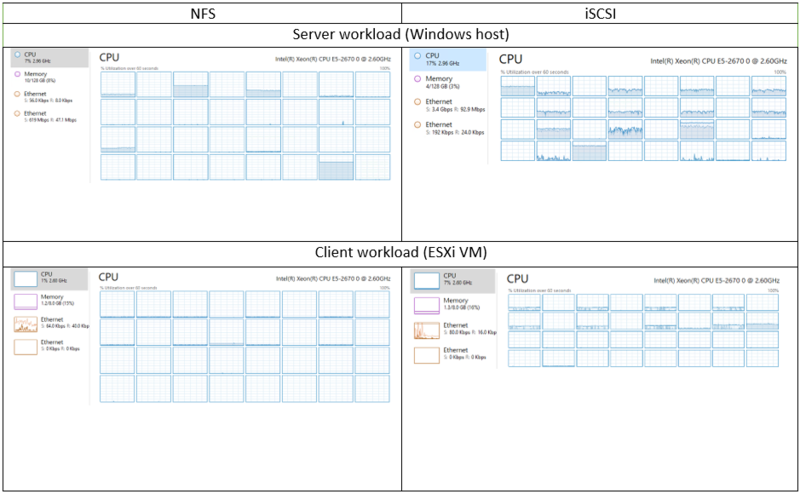 As you can see, with identical settings, the server and VM workloads during NFS and iSCSI testing are quite different. To give you the full picture of NFS performance and for additional comparison, I’ve decided to configure NFS on Linux OS. For this goal, I’ve chosen Ubuntu Server 17.10 distributive. Thus, I’ve measured the NFS server performance on Linux while VMware ESXi remained the client. 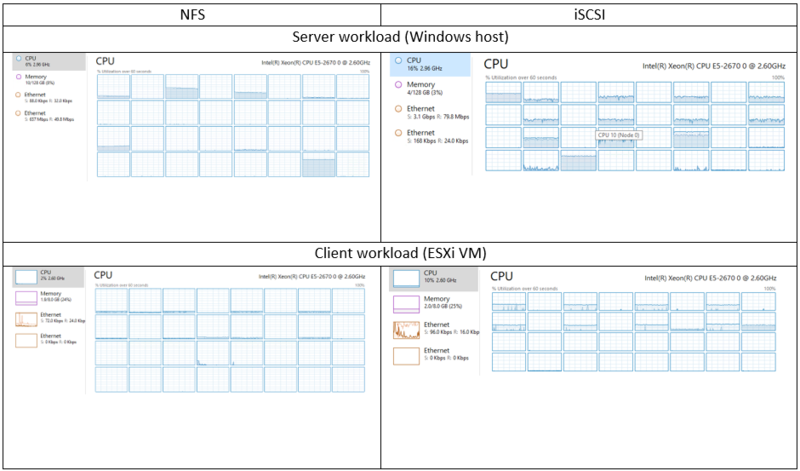 Comparing VM CPU workload during NFS server testing on different OS. In the screenshots below, you can see the virtual machine CPU workload during NFS server testing on Windows and Linux with 4k random read pattern. The assessment was held using DiskSpd. OK, let’s measure the VM CPU workload with FIO. What can I say at the end of the day? Having compared FIO and DiskSpd utilities, we can see that the results are almost identical. Only during measurements with 8k 50/50 Random/seq 70/30 Read/Write pattern, the outcomes were different. Probably, the tools provided different workload on the disk subsystem. OK, let’s take a look at what numbers tell us. I’ve conducted the further calculations using the test results I got with DiskSpd. When benchmarking NFS vs iSCSI, we can see that during testing under 4k 100%random 100%read patterns the iSCSI performance was 80.82% higher than that of NFS. Under 4k 100%random 100%write, iSCSI gives 91.80% better performance. Under 64k 100%seq 100%read pattern, iSCSI performance is 17.23% higher while under 64k 100%seq 100%write pattern, iSCSI beats NFS with 71.30% better performance. To top that off, under 8k 50/50 Random/seq 70/30 Read/Write, iSCSI shown 75.45% higher performance than NFS. Summary? It’s quite obvious, iSCSI protocol gives higher performance than NFS. As to NFS server performance on different operating systems, we can see that NFS server performance on Linux is higher than that on Windows. So, if your planning to build a virtualized infrastructure and can’t make up your mind on the network protocol…well, it’s obvious that iSCSI will give you much better performance and significantly lower latency. That may be a cornerstone for your production, but, it’s up to you to decide. However, I’m not done with NFS yet. Here, I have tested an compared NFS server performance on Linux and Windows so in the next part, I’m gonna measure how well NFS protocol performs on Linux operating system. For this goal, I’ll use Ubuntu Server 17.10 OS as a server, and Ubuntu Server 17.10 VM as a client running on top of VMware ESXi host. Stay tuned!